a filling station was opened to serve municipal vehicles with natural gas in 2003. Morges launched its Display® campaign in June of 2006 and took the opportunity to raise awareness among its entire municipal staff. In June of 2006, the awareness-raising campaign was launched starting with a large exhibition of 23 Display® posters in community buildings. Two information meetings with a slideshow on Display® were also held for different target groups : One of them focused on elected officials and top municipal managers, with a second focusing on all caretakers and technical staff. At a meeting of the city council in July 2006, members of the city council received this information. The press, radio, local television, and newspapers published in Morges and the francophone part of Switzerland gave great coverage of the launch of the Display® Campaign. _ In the first series of posters, energy officers recommended a few simple changes that people could make in their behaviour to reduce energy consumption. In the second series at the beginning of 2007, caretakers and building users themselves filled in this section of the posters after a meeting on the results from the previous year. Morges has designed and implemented some impressive campaigns to make its energy and water consumption more efficient in municipal buildings. It hung up posters indicating trends in consumption in its communal buildings to serve as the basis for the optimized management of consumption and as a guide for refurbishments. The cooperation of technical staff was crucial in this process, as was the participation of the users of the buildings, who had to change their everyday behaviour. The Display® Campaign is financed as part of the community’s budget. The largest item in the budget is labour invested by community staff. All communication is published by the community of Morges. The local press, which provided positive feedback on the Display® campaign and the city of Morges. _ The awareness-raising campaign targeted local administration, the city council, service technician managers, administrative officers, school principals, directors of kindergartens, and caretakers of municipal buildings. In total, 180 people were targeted. Lessons Learnt _ Thanks to the awareness-raising campaign, Morges was able to cut energy consumption by 10%. Even though little time has passed since these measures were implemented and it is hard to quantify the results, some improvements are obvious. For instance, many people have changed their behaviour to a significant extent, with colleagues often calling on each other to "think about sustainable development." 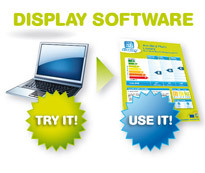 _ At the end of each year, the Display® posters are updated and the actions proposed on the posters completed. Starting in 2007, the posters will also show the specific effects of the renovation work done in the "before/after" section, and the efficiency gains made will be made visible if a building jumps up a class. _ A renovation programme integrated in the community’s investment plan will be taking place alongside the Display® campaign starting in 2007 with the town hall and the fire station. The goal is to reduce energy consumption there. _ In the future, Morges hopes to expand performance labels to private buildings (Congress Center, hotels, etc.). _ Finally, the community is looking for new ways to support communication and possibly work with other communities that take part in the REVE Jura-Léman project.